Haven't done an Illustration Friday drawing for ages, but here's this week's theme: stripes. 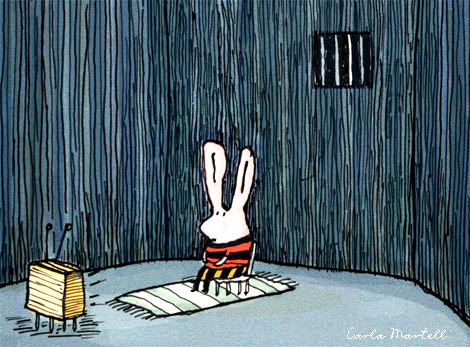 The bunny must have done something dire to end up alone in a room with just his telly and a barred window. Or maybe he's just hiding from the fireworks, which are still banging away here two days after Guy Fawkes night. Carla, can there be anything worse than being locked in a jail? Yes! being locked in jail and have a TV on in front of you! Very nice illustration and beautiful colours. I Love your style! That's a great bunny! And at least he has a tv and a nice rug and chair. I think you're right, he's probably hiding from all the racket. Great illustration :) i like the line work and colours. Hi, Carla, just came to say GOOD WEEKEND!!!! !